As some bearded guy in Game Of Thrones once said, winter is coming... which means long boot weather. The difficult journey of finding the boot that suits can be a long and arduous one, but we're here to hold your hand the whole way—we can DO THIS TOGETHER. Here are our eight best winter boots to keep you looking 100% boot-ylicious this cold season. Coachella is currently pumping in the US of A—and although you're not there looking smashing in the dessert wearing a flower crown with your bestie Tay Tay (*tear), doesn't mean you can't channel your inner festival filly. 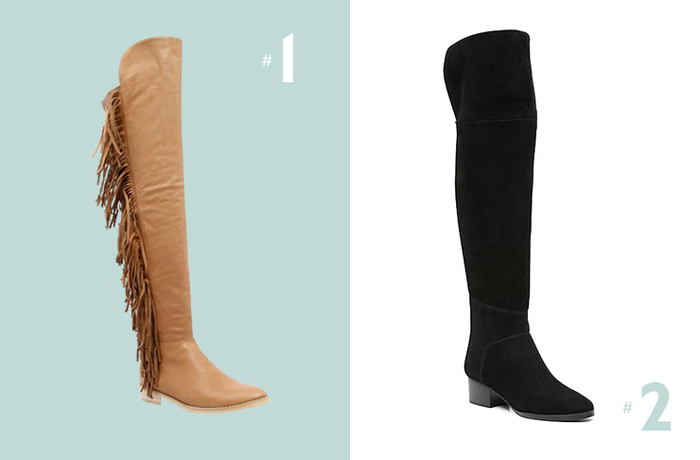 These Mollini boots bring two trends for winter into play: fringe AND long boots. Pair with skinnies and a band tee. Mollini 'Pinto' Boot in Camel Leather, $349.95 from Style Tread. Oh hey there Pam, we just want to let you know that this boot is for you. It's got a flat heel, which means you can wear them all day. It's black, which means it goes with everything. It's sleek and classic, which means it won't go out of fashion. Yep, it's got practical written all over it: in the best way possible. Witchery 'Sierra' Boot, $349.95 from Witchery online. If you're a fan of the finer things in life, and you're no basic B, these boots are for you: the taupe colour is chic, perfect for this season's natural colourways—plus the block heel paired with a rounded toe is a classic shape that won't age. Even if your ripped mum jeans paired with a crop top do. Nine West 'Snowfall' Boot in Taupe, $329.95 from Nine West online. Do you like to pair black with black? Then add something black to top off the look? Don't worry girl, Kookai has your back this season. 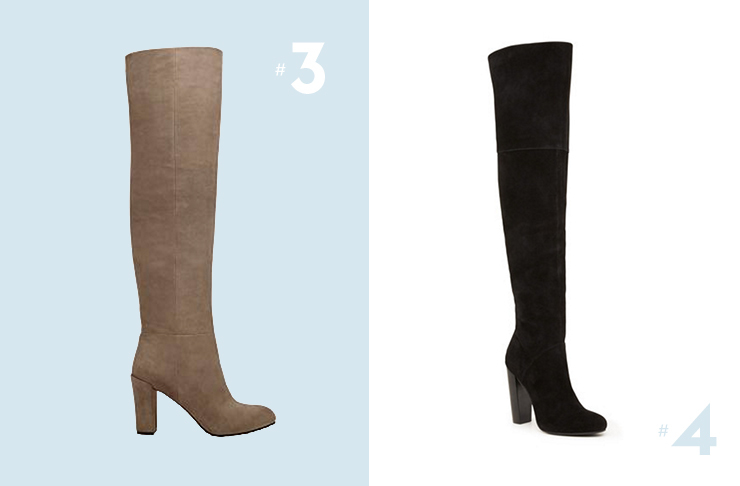 The Kingston over-the-knee boot is about to be the best purchase you've made in years—pull them over leather leggings and an oversized jumper for a slick casual look, or with an A line skirt and stripes for an on-trend nod to the 60s. Kookai 'Kingston' Long Boot, $300 from Kookai online. Don't look at the price. Just think about that iconic red heel strutting down the street. Think about the edgy lace-up detail paired with skinny jeans and an oversized white tee, like you totes don't give AF that you just emptied your account and aren't quite sure how you'll pay rent. There'll always be bills: but these Loubies are for life. 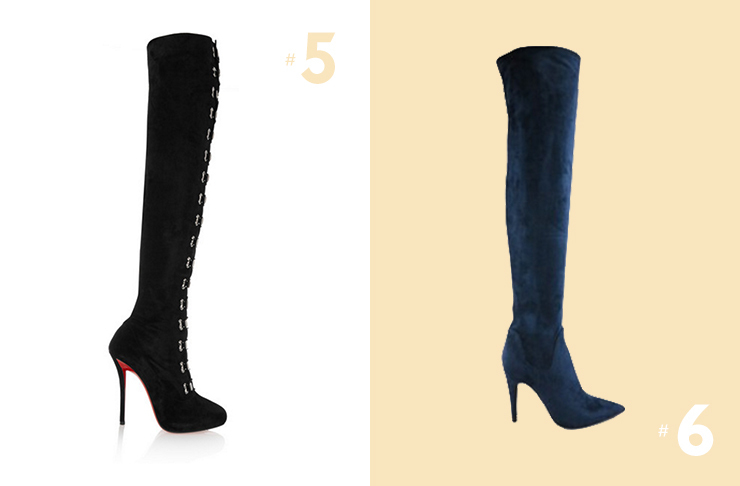 Christian Louboutin 'Top Croche 120' Suede Over-The-Knee Boots, $2,595 from Net A Porter. Bored of boring ol' black? Sick of beige, tan and taupe? Wittner understand your shoe-based frustration, and have delivered in (colourful) spades. We're loving this rich, navy suede—and dreaming about the colour combo with a floaty spring dress topped with a great coat for a night out on the town. Wittner 'Tammy' Boot in Navy, $269.95 from Wittner online. Mr Weitzman knows a thing or two about shoes—and these boots are exactly what we've been looking for for years. Tight to the calf and thigh? Check. Over the knee, without being fussy? Check. Classic heel and toe combo? Check, check, check. If you're an #investmentpiece kinda gal, these are the clear frontrunners. 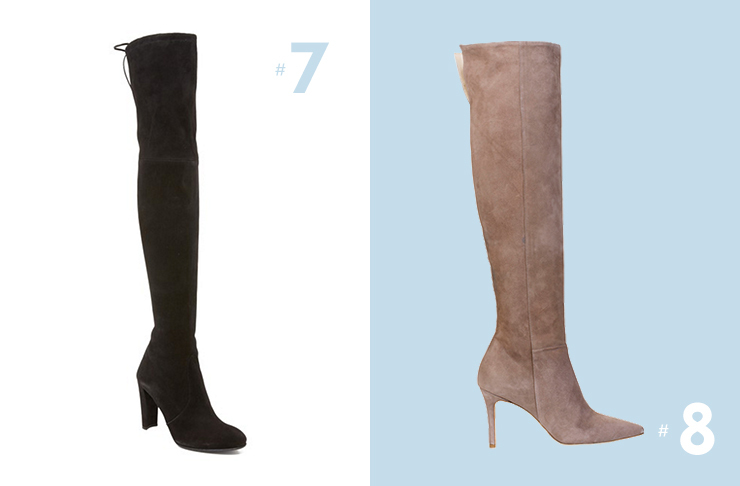 Stuart Weitzman 'Highland' Over the Knee Boots, approx $1,230 from Shop Bop. When you hear the word 'winter', do you think leather, fur and fabulousness? Then Dolci Firme have you covered, you glam Euro babe, you. These suede beauties will work back with denim and prints perfectly—and with a fur thrown over the top on the chilliest days? Forget about it. Dolci Firme Bianca Buccheri 'Velino' Boot in Taupe, $649 from Dolci Firme.